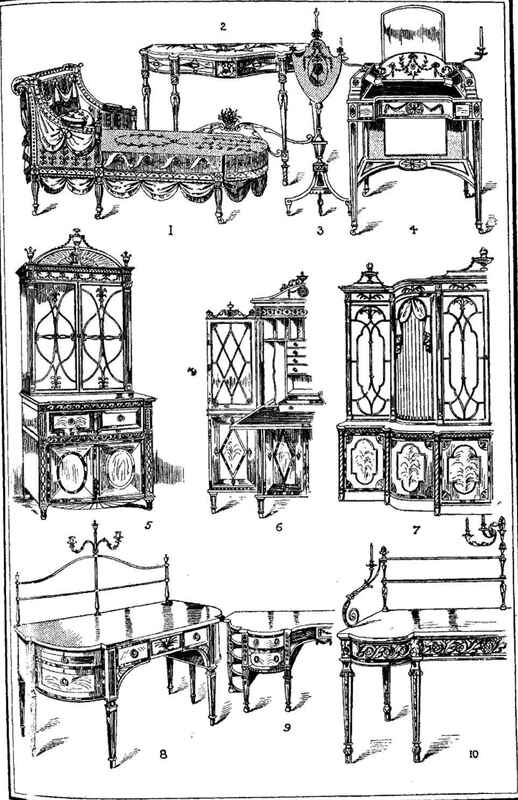 Proceeding to describe the interior of the sideboard itself, Sheraton says : " The right-hand drawer, as in common, contains the cellarette, which is often made to draw out separate from the rest It is partitioned, and lined with lead, to hold nine or ten wine bottles " (see Fig. 9). "The drawer on the left is usually plain, but sometimes divided into two ; the back division being lined with baize to hold plates, having a cover hinged to enclose the whole. The front division is lined with lead, so that it may hold water to wash glasses ; which may be made to take out or have a plug-hole to let off the dirty water. This left-hand drawer is, however, sometimes made very short to give place to a pot-cupboard behind, which opens by a door at the end of the sideboard. This door is made to hide itself in the end rail as much as possible, both for look and secrecy. For which reason a turn-buckle is not used, but a thumb-spring, which catches at the bottom of the door, and has a communication through the rail, so that by a touch of the finger the door flies open, owing to the existence of a common spring fixed to the rabbet, which the door falls against.
" In spacious dining-rooms the sideboards are often made without drawers of any sort, having simply a rail a little ornamented, and pedestals with vases at each end, which produce a grand effect/' Sideboards of this last-named type are described and illustrated in my chapter on "Heppelwhite." 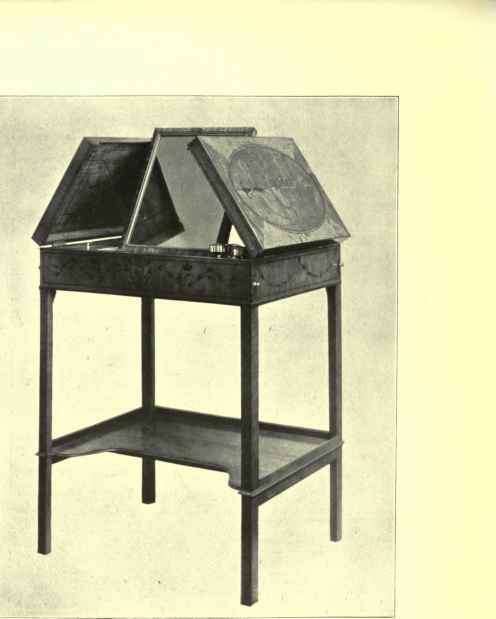 Sheraton continues : " There are other sideboards for small dining-rooms, made without either drawers or pedestals ; but have generally a wine-cooler to stand under them, hooped with brass, partitioned and lined with lead, for wine bottles, the same as the above-mentioned cellarette drawers."